Saint Luke, Bishop of Simferopol and Crimea, the Blessed Surgeon, was born Valentin Felixovich Voino-Yasenetsky (Валентин Феликсович Войно-Ясенецкий, polish spelling Wojno-Jasieniecki; April 14, 1877 and died June 11, 1961. Doctor of Medicine, Professor, and State Prize winner, since 1944 he was the Archbishop of Tambov and Michurinsk, and later of Simferopol and the Crimea. While he was serving the church as an Archbishop, he was also practicing as a surgeon and taught and published many books and articles on regional anesthesia and surgery. He is now known to be a world-famous pioneering surgeon. In November of 1995 he was announced as a Saint by the Ukrainian Orthodox Church, and was officially glorified by the Patriarchate of Russia May 25, 1996. He is commemorated by the church June 11 the anniversary of his falling asleep in the Lord. Born with the name Valentine Felixovitch Voino-Yassentsky on April 27, 1877 in Kerch (east Crimea), his family members were civil servants to Lithuanian and Polish Kings. The family was impoverished over time but Saint Luke remembers that he received his religious inheritance from his pious father. His first true understanding of the Christian faith came from the New Testament given to him at his high school graduation by his principal. He had an outstanding secular training. Having exceptional drawing abilities, he graduated the Kiev Academy of Fine Arts. [note 1] He decided however against pursuing art in favor of a career where he could help people who suffer, and chose to be a physician. In 1903 at the age of 26, he graduated from Great Prince St. Vladimir Medical School at the University of Kiev, and for a long time worked as a local district physician. An extraordinary medical student, he excelled at anatomy. His superior knowledge of anatomy served him throughout his surgical career. Out of compassion to the blindness that beggars were experiencing due to trachoma, Saint Luke studied ophthalmology at the Kiev ophthalmologic clinic. In a very short time he acquired a significant amount of ophthalmologic training. His knowledge of this subspecialty helped him treat not only his trachoma patients, but many other serious eye conditions as well. Another important event in Valentine’s life was the marriage to his wife Anna, a nurse. They had four children. The family was transferred frequently to various regional health care facilities and from the very beginning Valentine never requested funds from his patients, nor would he turn anyone away because of his ethnic background or personal beliefs. When his wife died, God in setting the path for Valentine’s Sainthood provided the family with Sofia Sergeevna who would be the joyful surrogate mother of his children during the harsh times ahead. Valentine never remarried. During his early career he published many scientific treatises and eventually became the head surgeon and professor of surgery at the hospital in Tashkent in March 1917. In October, Lenin took over the government and civil war erupted in Tashkent in January 1919. Lenin’s government disfavored any religious witness. Valentine was under constant threat, especially when treating party members but he refused to operate under any circumstances without the Icon of the Mother of God. His results were outstanding. These are some of the introductory comments from the memoirs of Saint Luke, that were kept by his secretary, E.P. Leikfeld. His words are not vainglorious, but a commentary on how God's plan was fulfilled through the life and example of Saint Luke. Living in the Ukraine during the oppressive period of communism, St. Luke stood out among his fellow physicians both as a surgeon and as a Christian. Even the communists coveted his talents for healing the body. Despite the dangers from the Lenin regime he fearlessly attended theological discussions arranged by Archpriest Mikhail Andeev. During this period when clergymen and pious people would prove their faith in blood, providence led the Archpriest to invite Valentine to the priesthood. Thus in 1921 at the age of 44 Valentine was ordained a priest. For two years, this exceptional individual was active not only in his pastoral work but in public and scientific activity. Certainly the charges were never proven but since the Party had to be infallible Fr. Valentine was convicted to sixteen years imprisonment. Noting Fr. 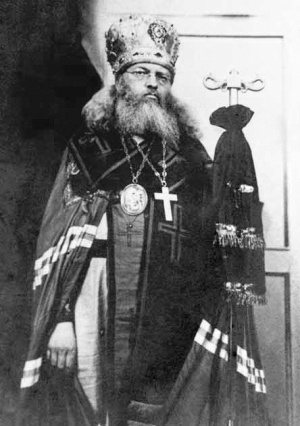 Valentine’s spiritual gifts, prior to his departure from Tashkent (arrest and exile to Siberia), in 1923 Bishop of Ufa Andrew (Ukhtomsky) administered monastic tonsure and facilitated his consecration as Bishop. [note 2] Almost immediately Saint Luke was sent to the first of his three imprisonments. Due to his talent as a surgeon there would always be placement at a remote medical facility where the attending colleagues would be astounded that a professor with such impeccable academic credentials would be subservient to the whims of the local civil authorities. Despite the criticisms of lesser surgeons Saint Luke would practice his medical skills. With the grace of God he amazed his colleagues with excellent medical outcomes in ophthalmologic and surgical cases that others deemed incurable. In 1926, Bishop Luke returned to Tashkent, but in 1930 was again arrested and sentenced to three years of exile. Upon his release, he once again returned to Tashkent, and spent his time in medical practice. As a physician and professor he trained many students and colleagues in the art of surgery, and as a scientist he found the time to publish many articles. A fruit of this work was the appearance in 1934 of his book "Notes on Purulent Surgery",[note 3] which laid the foundation for an entire medical specialty. For that work, Bishop Luke was awarded the degree of Doctor of Medical Science in 1936, and his work continues to be used in medicine to this day. This monograph and the subsequent revisions was the “gold standard” reference for his colleagues at the time. As a capable hierarch he strengthened the parishes and supported priests and church councils. As Saint Luke’s surgical and pastoral popularity would increase, the communist authorities would transfer him. When blatant injustices would be committed against Christians and fellow political prisoners he would initiate hunger strikes. The people who met him during his ordeals bore witness to his true character. As a physician he was Unmercenary and never asked for money treating all his patients with immense love. He shared his patients’ pain and anguish for he saw each person as an image of God, unique and unrepeatable. In 1940, Bishop Luke was sentenced to five years of exile in the Krasnoyarsk area. At the beginning of the Great Patriotic War (World War II), Bishop Luke offered the authorities his services as a doctor, and in 1941 was appointed consultant to the hospitals of Krasnoyarsk. In 1944, the archbishop was appointed to the kathedra in Tambov. In 1946, for outstanding scientific work in the area of medicine, he was awarded the “Stalin Award” for all his scientific publications. He donated almost all of the money to help children who had suffered as the result of the War. 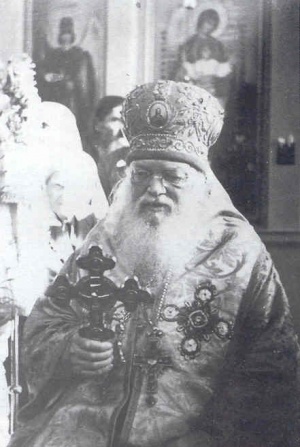 Also in 1946 Vladyka was appointed to the kathedra of Crimea, where at first he combined archpastoral service with medical assistance to the people, but later dedicated himself to Church service, zealously working to build up Christ’s vineyard, something that, under the conditions of life under Communist authorities, then demanded great courage and faith. As a Bishop he preached incessantly not only about the need to live Orthodoxy but against the perils of the “Living Church”. The latter was a defiled heretical sect propagated by the communist regime. He is credited with 1250 sermons over 38 years of priesthood and episcopal service, of which 750 are preserved in twelve volumes. When he practiced surgery from this point on, he wore his bishop's cassock in the operating room, and refused to perform surgery without an icon. As the regimes of Lenin, Stalin, and Khrushchev came and went, Saint Luke’s persecutions and frequent transfers only increased his popularity. Despite public slander, he was known as an unselfish, loving, physician and spiritual father. This posed a great propaganda threat to each regime and towards the end of his life Saint Luke was restricted in his travels and his medical responsibilities to remedial services. This also was in God’s plan, as towards the end of his life Saint Luke lost his vision to glaucoma. He could now devote his time exclusively to matters of faith. He performed many healing miracles and had many spiritual children. Towards the end of his life he was worried if it would be permitted to chant “Holy God” at his funeral. He last celebrated the Divine Liturgy on the feast of the Nativity of Christ in 1960, and his last sermon was on Forgiveness Sunday. His repose was June 11, 1961, the day of commemoration for “All Saints who shone forth in the Land of Russia”. The government made every effort to make Saint Luke’s funeral as inconspicuous as possible. Buses were provided to hurry the funeral procession along the side-streets to the gravesite so there would be little fanfare and recognition. God had different plans for Saint Luke and a popular uprising occurred at the funeral. The faithful refused to be hurried. They boldly ignored, at peril to life and limb, the roadblocks to the central corridors. The mayor was angered because of the roses spread on the roads, and flung a basket away claiming that the roses were litter and trash on the streets. [note 5] To the dismay of the government and to avoid an uprising, they conceded to allow the funeral to proceed for three and a half hours without interference. The roads were full and cars stopped everywhere. People had climbed on balconies, onto rooftops of houses. Such a funeral was a tribute of honor. The authorities wanted a silent event. It was witness to God’s Glory that throughout the walk there was a constant chant of “Holy God, Holy Mighty, Holy Immortal have mercy on us”. Saint Luke’s prayers to have “Holy God” chanted at his funeral during the atheistic times were answered! On March 17, 1996, St. Luke's remains were disinterred, with an estimated 40,000 people taking part. It is said that an indescribable aroma arose from his relics, while his heart was discovered incorrupt, a testament to the great love he bore towards Christ and his fellow men. 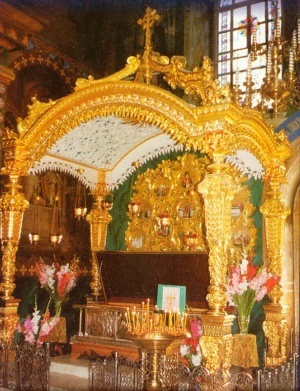 Three days later on March 20, 1996, his relics were transferred to the Church of the Holy Trinity. His relics continue to work countless miracles, in the Church of the Holy Trinity in Simferopol, at Sagmata Monastery in Greece, and throughout the world. Holy Hiero-confessor St. Luke (Voino-Yasenetsky) was a precious vessel of Divine grace. Like his heavenly patron, the Holy Apostle St. Luke, he was a physician who continued Apostolic work; like the Apostle Paul he preached Christ’s Gospel not only in church but in prison, in exile, to friends, to persecutors, to well-wishing supporters, and while enduring sorrows at the hands of false friends. He was one of those people of unique importance to people who cannot do something for themselves alone, who cannot limit themselves their activities to only what pleases them. For such people, the duty of serving one’s neighbor is not an empty phrase, and for that reason in their activities they do not make choices by mere chance, do not build on a foreign foundation, but strive to find what needs to be done, right here and right now, and what will benefit all society. These are builders and workers who boldly come out onto the field of life in response to the Lord’s challenge. To the ten talents given them by the Lord they return an additional ten. And that is the embodiment of the Gospel model for all of us. St. Luke gave a sermon in Alushta, in Crimea, on August 12, 1956 , of which an audio recording exists. Various verses from Ephesians and excerpts of this sermon have been loosely translated and paraphrased into Greek and English, and the resulting passage is often incorrectly described as St Luke's last words in many Greek-language and English-language websites and publications. И да, конечно, для бесов, для самого диавола в высшей степени выгодно, чтобы в них не верили, чтобы никогда о них не думали, чтобы никогда не ощущали близости их, ибо скрытный, неведомый враг гораздо опаснее врага видимого. И эти враги Божии, бесчисленные, ставят своей единственной задачей, день и ночь заботятся о том, чтобы губить нас, чтобы толкать нас на путь зла, на путь неверия, на путь нечестия. Δεν έχουμε να παλέψουμε με ανθρώπους, αλλά με αρχές και εξουσίες, δηλαδή με τα πονηρά πνεύματα. Τον διάβολο δεν τον συμφέρει να δεχθεί κανείς την ύπαρξή του, να σκέφτεται και να αισθάνεται ότι είναι κοντά στον άνθρωπο. Ένας κρυφός και άγνωστος εχθρός είναι πιο επικίνδυνος από έναν ορατό εχθρό. Ο πόσο μεγάλος και τρομερός είναι ο στρατός των δαιμόνων. Πόσο αμέτρητο είναι το μαύρο τους πλήθος! Αμετάβλητα, ακούραστα, μέρα και νύχτα, επιδιώκουν να σπρώξουν όλους εμάς που πιστεύουμε στο όνομα του Χριστού, να μας παρασύρουν στό δρόμο της απιστίας της κακίας και της ασέβειας. Αυτοί οι αόρατοι εχθροί του Θεού,εχουν βάλει ως μοναδικό τους σκοπό μέρα και νύχτα να επιδιώκουν την καταστροφή μας. Όμως μη φοβάστε,πάρτε δύναμη από το όνομα του Ιησού"
Arm yourselves with the armor that God gives, That you may withstand the devil's tricks. ↑ National Academy of Fine Arts and Architecture. ↑ When consecrated Bishop, he was given the name Luke after the Apostle who similarly, in addition to being a physician and evangelist, was a talented iconographer. ↑ “Essays on the Surgery of Pyogenic Infections,” or “Purulent Surgery Essays,” published in 1934. ↑ On December 5, 1937, after being sleep deprived and interrogated for three weeks he broke down in a state of hallucination and signed a confession that he was a counterrevolutionary. ↑ He soon after had a very ugly death. Canadian Orthodox Messenger (OCA, Archdiocese of Canada). 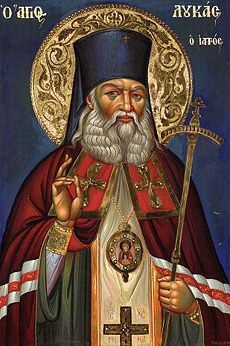 Lives of the Saints: Saint Luke, Archbishop of Simferopol. (Glorified 17-19 March 1996). New Series 14:1 Winter 2002/2003. pp.13-15. Dr. Alexander Roman. Saints of the Ukrainian Orthodox Church: New Martyrs and Confessors of the Soviet Yoke. (List of glorified Ukrainian Orthodox New Martyrs and Confessors). Russian Orthodox Church (MP). His Holiness Patriarch Alexy II of Moscow and all Russia Visits the Tambov Diocese. 28 October, 2002. The St.Petersburg Times. City Teacher, Nurse, Actress Gave War a Female Face. Issue #1067 (33), Friday, May 6, 2005. Evgueny I. Arinin. Essence of Organic Life In Russian Orthodox and Modern Philosophical Tradition: Beyond Functionalism and Elementarism. "Science and Religion" An article by St Luke on the compatibility of science and religious faith. (French) Orthodoxologie. Saint Archevêque Luc ( Voino-Yasenetsky) de Simféropol. Dimanche 27 Juillet 2008. (Greek) Ὁ Ἅγιος Λουκᾶς Ἀρχιεπίσκοπος Κριμαίας. 11 Ιουνίου. ΜΕΓΑΣ ΣΥΝΑΞΑΡΙΣΤΗΣ. (Greek) "Ρωμηοσύνη". Η Μ.Κ.Ο. "ΡΩΜΗΟΣΥΝΗ" ΣΥΜΜΕΤΕΧΕΙ ΣΕ ΣΥΝΕΔΡΙΟ ΓΙΑ ΤΟΝ ΑΓΙΟ ΛΟΥΚΑ ΤΟΝ ΙΑΤΡΟ ΣΤΗΝ ΚΥΠΡΟ. 24-10-2008 (Γρηγοριανόν); 11-10-2008 (Ιουλιανόν). (Greek) Αγιος Λουκάς Συμφερουπόλεως - Κριμαίας. Στο Ησυχαστήριο της Αδελφότητας των Δανιηλέων στα Κατουνάκια Αγίου Όρους ο Πάτερ Δανιήλ Αγιογραφεί τον Άγιο Λουκά τον Ιατρό Αρχιεπίσκοπο Συμφερουπόλεως και Κριμαίας. NASA Jet Propulsion Laboratory. 6161 Vojno-Yasenetsky (1971 TY2). This page was last edited on September 12, 2014, at 07:29.